You are here: Home / Kid Crafts / Gnome Paper Roll Craft – Fun, Quick, and Adorable! 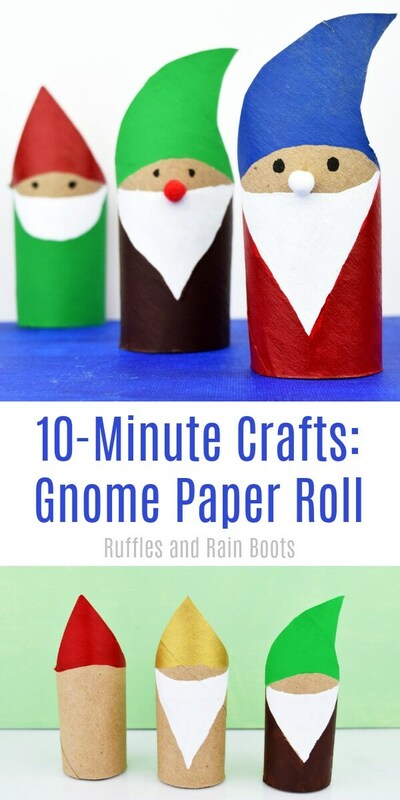 Gnome Paper Roll Craft – Fun, Quick, and Adorable! 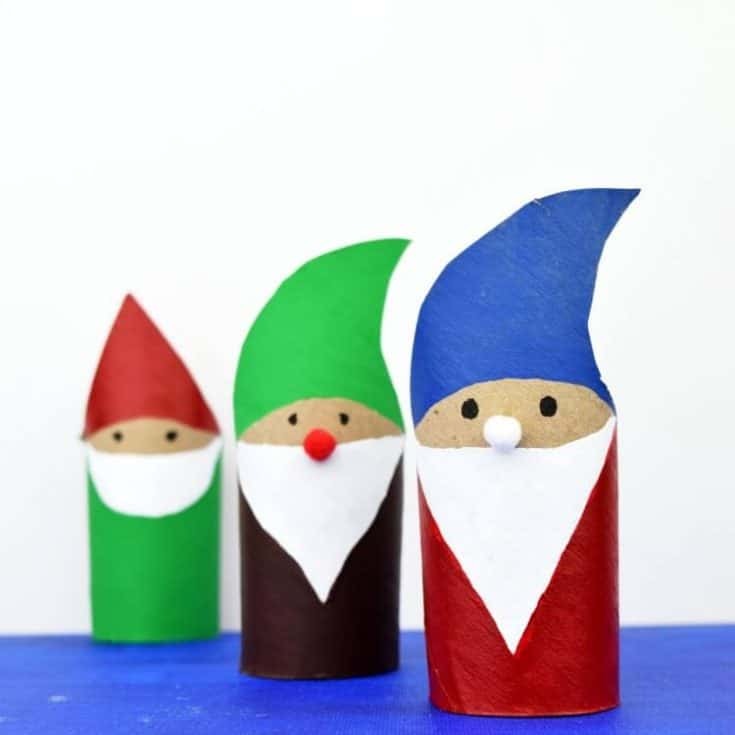 This gnome paper roll craft will have everyone smiling. The entire craft is set up and done in 10-minutes, so it makes a wonderful quick craft for kids. Let’s get started with this adorable toilet paper roll gnome. There are affiliate links in this article which means, at no additional cost to you, we could receive compensation for our recommendations. You can read our disclosure policy. clean up – less than 1 minute. My daughter likes both of those movies, by the way. 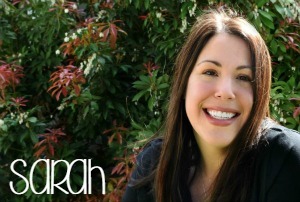 And, surprisingly, my husband and I catch ourselves laughing quite a bit during them. It’s quick and easy and so is the supply list for this fun toilet paper roll gnome. I’m not sure anyone actually needs instructions for this. We painted a few, however, and do have some tips. Cut two slits down opposite sides of the toilet paper (same end). Cut in between those slits on the back of the gnome. Fold down the pieces and cut them across the back (from one slit to the other). Cut the front of the toilet paper gnome into, well, a little gnome’s hat. You can cut a pointy hat (center point) or a curved, floppy hat. We’re like both. Paint the hat. Leave room for a face (just the eyes and maybe a nose) and paint the beard white. You can make gnomes with short beards, long beards, pointy beards, rounded beards – the sky is the limit here. Paint the body. We messed up from time to time, however, try to follow the beard and paint the body. You’ll go from under the sides of the hat down to the bottom of the roll. Use the marker and draw on eyes. You can add a pompom nose with a dab of glue if you’d like, and you’re done! 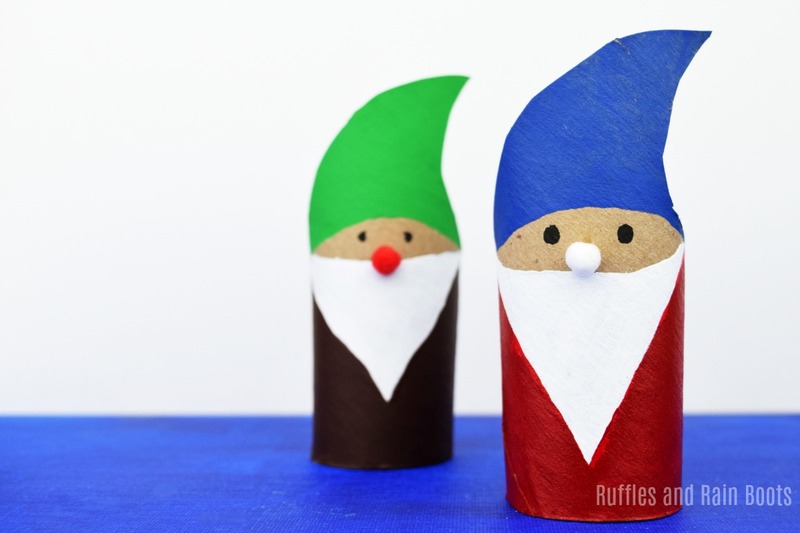 Isn’t this gnome paper roll craft adorable? 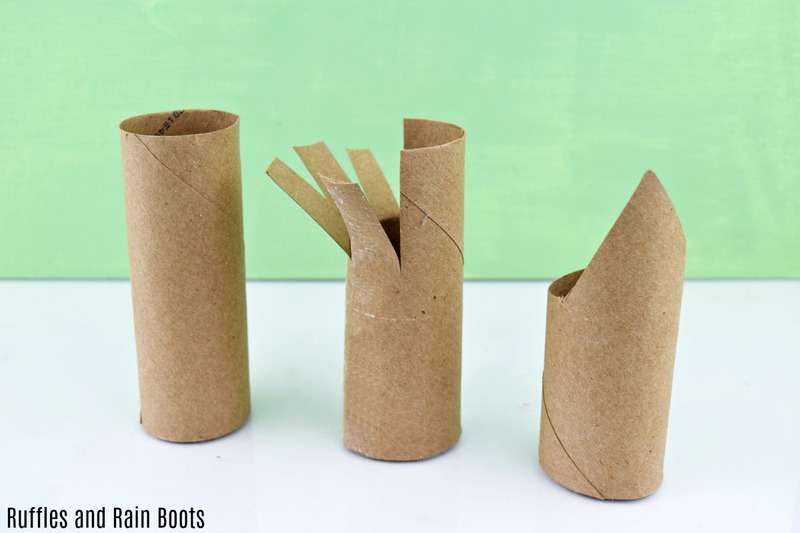 Gnome Paper Roll Craft - Fun, Quick, and Adorable! 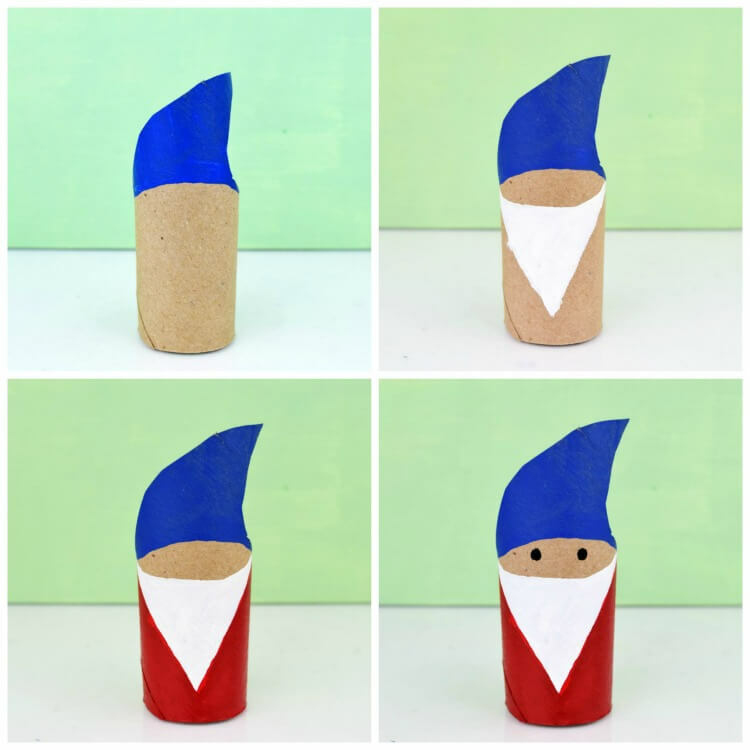 This gnome paper roll craft will have everyone smiling. The entire craft is set up and done in 10-minutes, so it makes a wonderful quick craft for kids. Cut the front of the toilet paper gnome into, well, a little gnome's hat. You can cut a pointy hat (center point) or a curved, floppy hat. We're like both. Paint the hat. Leave room for a face (just the eyes and maybe a nose) and paint the beard white. You can make gnomes with short beards, long beards, pointy beards, rounded beards - the sky is the limit here. Paint the body. We messed up from time to time, however, try to follow the beard and paint the body. You'll go from under the sides of the hat down to the bottom of the roll. Use the marker and draw on eyes. You can add a pompom nose with a dab of glue if you'd like, and you're done! 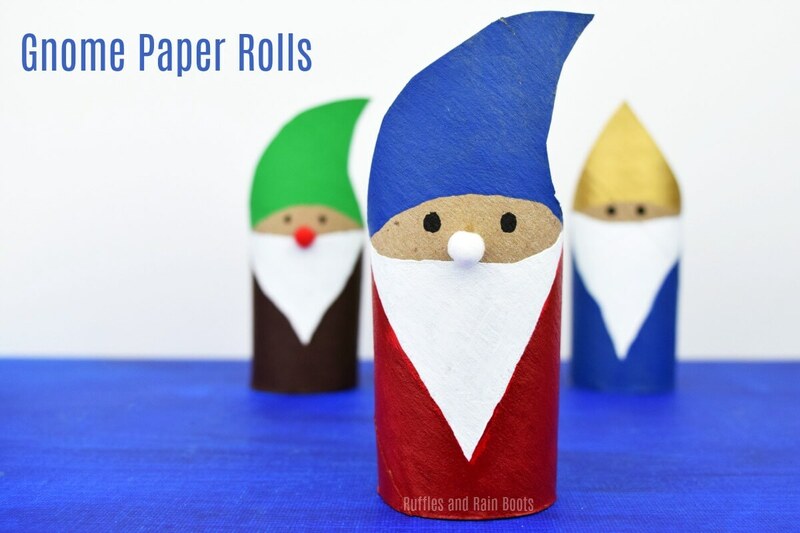 Isn't this gnome paper roll craft adorable? We thought he was so cute we had to give him some friends! Fire-Breathing Dragon Paper Roll – hands down, this is my favorite paper roll craft EVER. Eagle Paper Roll Craft – combined with handprints, this is creative and so much fun. Jungle Paper Roll Animals – the elephant sort of stole my heart. A to Z Animal Toilet Paper Rolls – one for every letter is dedication. Your shares are how we grow and we are sincerely grateful. Wouldn’t this be great for a Kindergarten craft or saved to your Christmas board? They’re just too cute and quick to make.